Portland's newest beer festival is... Cherry Festivus! With such a domineering beer fest scene in Portland eventually there will be one for every sub-style of beer, although don't hold your breath for Gruit-Fest. This November 20th and 21st Bazi Bierbrasserie will be hosting their inaugural Cherry Festivus with a huge section of Krieks and other cherry infused beers this fest is sure to delight. What simpler pleasure than nature's finest Cherry? Tart, sweet, distinctly it's own flavor, the Cherry goes well with sweet or savory as well as Beer and Cider. The Cherry may be the world's most popular fruit and there is a world of beers to showcase them. So the creators of uber-popular events like the Portland Fruit Beer Festival and the Peche Fest are pleased to announce the first annual Cherry Festivus, a showcase of 25+ beers featuring Cherries and a cider. 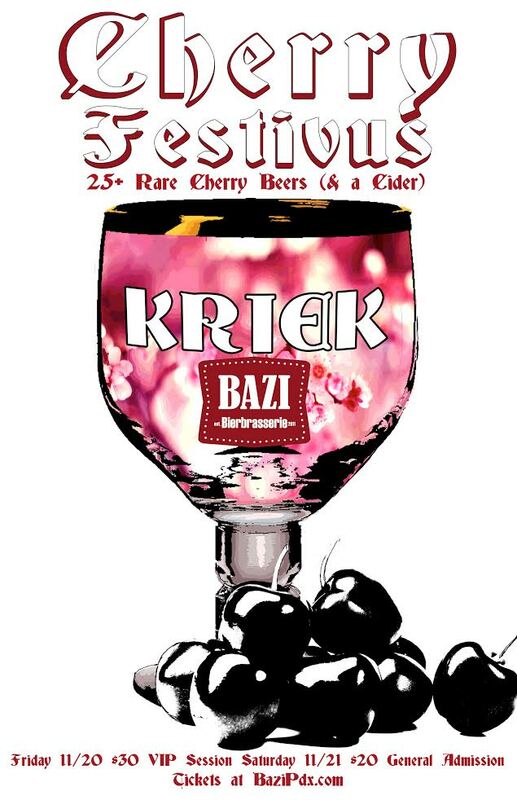 The Cherry Festivus will be held with a VIP session on Friday November 20th at Bazi Bierbrasserie in SE Portalnd and a general admission session on Saturday November 21st. This limited, premium event features a collection of rare artisinal beers and ciders that are hard to find or made exclusively for this event. As organizers work to confirm the full taplist they can reveal a handful of special kegs from some of Oregon and the world's best breweries and cidery: Block 15 Brewing, Crooked Stave, De Garde, Upright Brewing, Ecliptic Brewing, Hanssen's and more. In addition to beer, the Bazi Bierbrasserie bar will be serving new cherry cocktails and a special food menu including a Cherry Flemish Stew. Tickets are now on sale for $30 for the Friday 11/20 VIP session that opens at 5pm. In addition to being able to attend the festival a day early, attendees receive a glass and 7 drink tickets. Most items will be 1 ticket per 4oz pour. Saturday 11/21 Noon to 11pm General Admission tickets are on sale for $20 and you receive a glass and 6 drink tickets. Additional tickets are available for $2 each. There are only 200 glasses for the festival, there may be passes available at the door on Saturday but to assure entry we recommend purchasing in advance. A brand new Imperial Porter with Cherries from Brewmaster Tonya Cornett. strong cherry ale fermented with our house “wild blend” containing three types of Brettanomyces, Lactobacillus and a saison yeast. 100% keg conditioned for maximum flavor development from the Brett. 7.9% Abv. Brotherly Love is our Belgian Dark Strong Ale, Little Brother, aged in second-use Bourbon barrels with Northwest grown sour cherries and Ecuadorian cacao nibs roasted by Woodblock Chocolate in SE Portland. L’Brett d’Cherry starts as our favorite Golden sour barrels that we blend together into our large oak foeders for secondary fermentation with 4,000lbs of Colorado harvested sour cherries. 6% Abv. We take our Burgundy sour base beer and age it in used Bourbon barrels before blending select barrels into our large oak foeders and additionally aging on 3,000 lbs of Colorado harvest sour cherries. 7% Abv. The biggest of the three Cherry beers we made in 2015, we pack all the cherries we can into this beer aging for months in our foeders. The result yields cherry, cascara and coffee aromas and flavors with a light hint of whiskey barrel character to warm the finish. 9.666% Abv. Wheat beer aged in a single Pinot barrel with Brett Brux and Oregon tart cherries. Funky brett aroma, medium red color. Mild tartness. Estimated 7.5% Abv. Berliner-weisse style sour wheat beer brewed with Cherries and Blueberries. The Dissident is an Oud Bruin, a distinctive Flanders-style sour brown ale, with a heavenly aroma and flavor. Our first wild yeast beer, we use Brettanomyces and local cherries to give The Dissident its characteristic sour taste. Our stiffest brewing challenge, it must be fermented in isolation from our other beers for a full 18 months, partly in pinot and cabernet barrels. The words coddled and “worth it” come to mind. 10.7% Abv. A brand new single small batch beer created for and debuting at the Cherry Festivus. New Belgium Brewing and Old Beersel of Belgium have partnered to create Transatlantique Kriek, a spontaneously fermented lambic ale made with sour cherries. This authentic kriek beer began life in the oaken vessels at Gert en Jos Christiaens’ brewery in the Lembeek region of Belgium. After more than two years aging, Oud Beersel’s offering shipped across the Atlantic and found its way to the intuitive palate of New Belgium’s brewmaster, Peter Bouckaert. After much sampling and internal consultation, Peter and his brew staff created a full-bodied Belgian golden lager to round out the light-bodied kriek. The cherry nose gives way to a pleasingly sour flash across the palate that rolls gently into a slightly sweet finish. Crisp, effervescent carbonation keeps the mouthfeel bright and delightfully tingly. 8% Abv. Eight years after brewing our first batch of beer, we felt the need to celebrate our success with the small community of our most loyal supporters. To commemorate this occasion, we crafted this Belgian Ale and matured it in a handful of select pinot noir wine barrels and aged it with Northwest grown cherries . This Belgian Kreik-inspired ale has flavors of tart fruit, oak, and just a touch of funkiness from the Brettanomyces. Raise your glass of Oakshire's Brewers Reserve 8, and say it out loud, "Cheers to Eight Years! Ale aged on cherries. Traditional Belgian Kriek, pleasingly tart with a touch of sweetness. Brewed exclusively for Brewery Ommegang by Liefmans, a sister brewery, in Belgium. Our award-winning Doryman’s Ale is aged for 4 months in wheat whiskey barrels with a blend of two Oregon cherry varietals. tartness on your palate. The Cascade and Mt. Hood hops provide just the right amount of their wonderfully assertive character to give this beer its clean and balanced finish. This cider is a take on a very old recipe dating from early 1600s colonial America, with a modern twist of added carbonation. Raisins, unrefined cane sugar, cinnamon and nutmeg were fermented to dryness with oak. This special Cherry Fest keg has the added delight of juice from Washington-grown Montmorency and Hungarian Balaton tart cherries. A newly released sour Red ale with Cherries. A barrel-fermented Saison with fresh Cherries added from Baird Family Orchards. The Hearts’ Beat pours intensely red and drinks with a huge tannic quality, showing bits of brett lambicus and orchard yeasts in the flavor. The first Kriek Lambic in our LAMBICKX line! Wonderful aroma of almonds, macaroon and cherry stones. Dry, elegant fruit palate. Lightly sparkling to still. Lambics are truly the "wines" of the beer world. Just as wines vary by season, soil, climate, and aging method, lambics (unlike any other type of beer) vary by season, brewery location, barrel size and wood type and length of aging. 6.5% ABV.